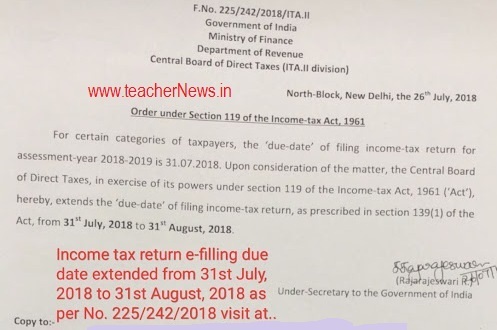 Income Tax Return e Filing Extended Date on 31st August 2018 - IT E filling in Telugu : The government of India on 26th July 2018 Thursday extended the last date for filing income tax returns for the assessment’s year 2018-19 by a month to 31st August 2018. The new income tax return forms were notified early in April and taxpayers (whose accounts are not liable for audit) were allowed to e-file their ITRs till 31st July 2018. “Upon consideration of the matter, Central Board of Direct Taxes (CBDT) extends the ‘due date’ for the filing of Income Tax Returns from 31st July to 31st August 2018 in respect of the said categories of taxpayers,” a Finance Ministry statement said. – PTI. The assesses can now file income tax returns for AY2018-19 by August 31. 6.84 crore income tax returns were filed in FY2017-18. Not filing income tax return in due time attracts penalty up to Rs. 10,000/-. Ministry of Finance : Upon consideration of the matter, the Central Board of Direct Taxes (CBDT) extends the ‘Due Date’ for filing of Income Tax Returns from 31st July, 2018 to 31st August, 2018 in respect of the said categories of taxpayers. Income tax return e-filling due date extended from 31st July, 2018 to 31st August, 2018. Income Tax Return Filing Deadline Extended Dates.